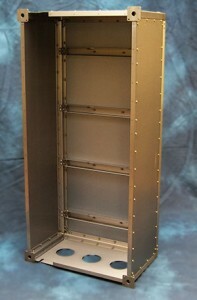 Ventura Aerospace has manufactured custom aircraft equipment racks for numerous customers. These 19.0 inch racks are available in multiple sizes and load ratings. Our standard racks are rated for 9G crash loads while custom solutions have been rated at 16G. The racks can be used for electronic equipment or set up as operator consoles for special mission aircraft. Our engineering group can design and certify an equipment rack for your aircraft needs. We use these racks for our own flight test programs as they have a high degree of modularity. For information on our rack solutions please contact us.